I met Casper, the friendly ghost . . . The image below shows a table setting created by one of my three daughters (the middle one in age), the one that lives, loves, labors and languishes in the remote and desolate northern climes, specifically in Alexandria, Virginia. That ghostly image in the center of her butternut and acorn squash soup is a dollop of cream cheese. In her posting she likened it to a ghostly figure, and I likened it to a specific ghost—Casper, The Friendly Ghost of cartoon fame. Read her post here for her narrative of the occasion and the soup’s ingredients. The text that follows is my comment on her posting. I found it so beautifully composed and presented that I decided it deserved its own post—its own spotlight, so to speak. I can say that with all humility. In fact, if I weren’t so humble I would be perfect! En la madrugada—as freely translated from Spanish to English the term means “in the wee small hours of the morning“—I was standing at the computer we used to input vehicle license numbers, trying desperately to stay awake with very little success. However, every time I went to sleep my knees buckled and I awakened, or at least I became partially awake, not very alert but at least awake. Casper appears to be drowning in Michael’s soup, a somewhat more ominous image than dancing, or perhaps playing Scrabble—the ghostly figure seems to be reaching for a Scrabble tile on its right—but perhaps not. Your ghost also resembles Casper the Friendly Ghost, a nebulous presence I encountered on the bridge that spans the Rio Grande River, a shallow and horribly polluted stream that divides the US from Mexico! 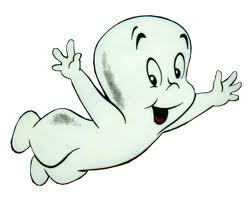 I met Casper the Friendly Ghost many years ago at a lonely Texas-Mexico border crossing. I was working the midnight shift—12 midnight until 8 AM, and I was one of only three people on duty. The others were an Immigration officer and the outbound toll collector, and both were sound asleep, trusting me to guard them and the United States of America from harm by applying my accumulated knowledge of outbound and inbound restrictions that were promulgated by the USA and Mexico. Mine was a Herculean task, but I usually managed to do it successfully over my two-hour shifts during the assigned eight hours until I was relieved by the Immigration officer. And what to my wondering eyes should appear—no, no, not Santa Claus and his reindeer-drawn sleigh piled high with Christmas gifts for the world’s children. What appeared to my wondering eyes was Casper the Friendly Ghost of cartoon fame, dancing around in the bright light, appearing and disappearing while I watched. I rubbed my eyes roughly several times, but he continued capering under the hanging light, sometimes small and at other times larger. I imagine that by now you, the reader, are highly skeptical but this story is true—I should know because I was there. The bridge to Mexico began some 100 feet from my position, and there was a brilliant light erected on a tall pole beside the pedestrian walk. During one of the many times I awakened, I focused my gaze on the lighted area and I began seeing movement high up near the source of the light, something similar to a swarm of bees or scudding clouds or rising flights of birds or bats, forming shapes that would rapidly change, literally disappearing for a split second before forming a new shape. As I walked slowly toward the bridge I continued trying to come fully awake, and I hitched up the weapon I was required to wear, a six-shot revolver with a six-inch barrel—the hitching-up was needed because the belt was too large for me. Mind you, I had no intention of shooting Casper—I could never do that—my children would never have forgiven me. As an aside to this posting, after several months on duty at the bridge the pistol belt fit snugly because of the frequent meals delivered at a highly reduced price—not gratis, but close—from a Mexican restaurant on the other side of the bridge. As I slowly drew closer to the lighted area, all the while keeping my gaze on the forms that were—-well, they were forming and re-forming, and the shapes suddenly devolved into untold thousands of swarming insects, appearing and disappearing as they circled under the light. Many more thousands were on the street and the sidewalk, some dead and others still moving. I was finally wide awake and feeling considerably better—Casper had disappeared. The insects were willow-flies, creatures that were born under water in soapstone banks and rocks. At birth they rise to the surface and lie there until their wings dry enough for them to take off from the surface of the water. Willow-flies only make one flight because they can only take off from water, and once they land they are finished. I have no doubt that, now that you know I met Casper the Friendly Ghost many years ago, you will pester me until I post that story on my blog. Okay, okay! I’ll start on it! Contrary to my usual promises I did post the event, albeit 360 days later (last year on 12 January 2011, and it is reproduced exactly as I posted it as a comment on my daughter’s blog.